So, our garbage disposal has been down for a while, finally, Dave got time to get it done! This how-to video is about 30 minutes long, it's in great details, but not very good quality. It shows how Dave remove the old disposal and install the new one, with tips and tricks along the way! Hope you enjoy the video and hope it's helpful! Please drop us a line with your feedback! Thank you! We live in a condo so space is tight. There is a space where we want to put a table. As we look and look, we just couldn't find a good fit for it. Then, Dave came up with this idea, why don't we just custom make one! 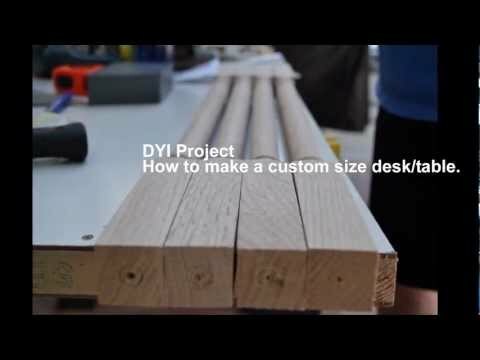 Step by step instruction on how to make a custom size table. Now this table fits perfectly! Welcome to Dave's DIY Home Projects! Welcome to Dave's DIY Home Projects! This blog is actually created by both Dave and his wife - Wini - to document things that he has done around the house, and hopefully be helpful to others as well. Disclaimer : ) --> Dave is not a professional handy man, but working various projects at home is his passion. Please drop us a line and share thoughts, tips and techniques!